Having had a rather negative few weeks in the garden over July and August (burnt plants, drought etc. ), I’ve decided to blog about something much more positive and uplifting this week. This morning I was taking photographs of numerous bees who were in love with our dahlias. Dahlia Verrone’s Obsidian to be precise. 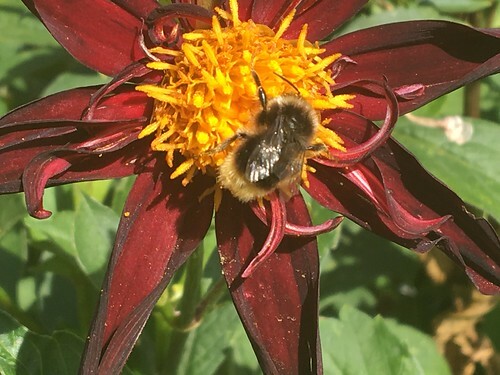 A really dark, velvety red dahlia with a deep golden centre, rich with pollen for the bees. When asked to think about something that is life-sustaining, I suspect most people would cite water. Bees are not the first thing we think of but, with their ability to pollinate crops, they are absolutely vital to our existence. I’m sure you don’t need me to tell you that currently our bees are under serious threat. If it isn’t pesticides, then it’s the varroa mite or the lack of flowering plants that is out to get them. The EU has now taken action to ban neonicotinoids on outdoor crops which is certainly an important step but, like so many environmental causes, we can all play a small part in trying to save our bees. 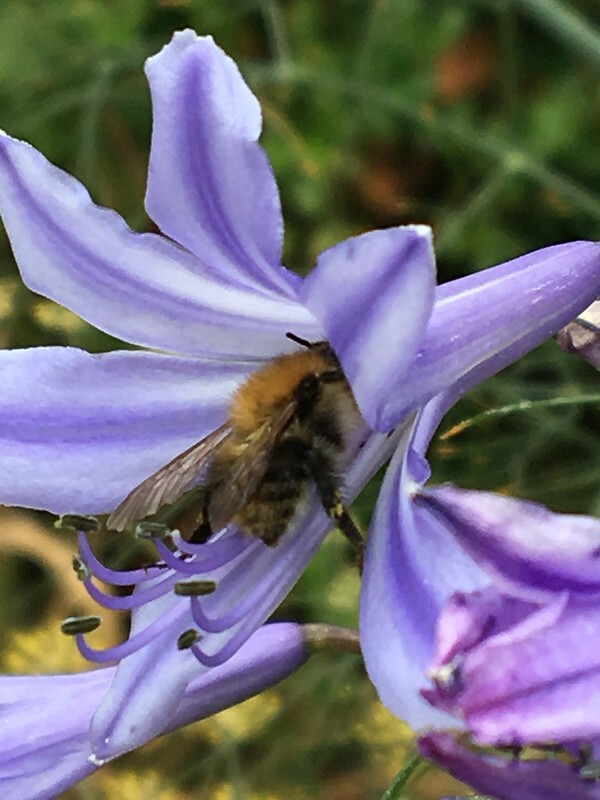 Organisations such as Friends of the Earth and the Royal Horticultural Society (RHS) have highlighted just how important our own back gardens are in helping our bees. The RHS has its ‘Perfect for Pollinators’ plant label to encourage gardeners to purchase plants that are rich in pollen and easy for bees to access. Even simple things, such as planting single rather than double flowered plants, all play their part. 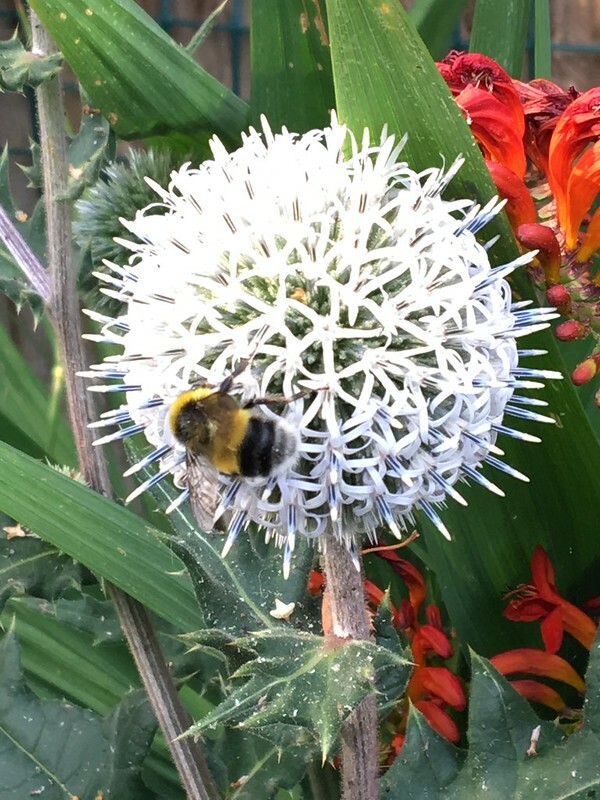 For the last few years we have made the effort to ensure that any new plants we buy are ‘bee friendly’ and, judging by the number of bees we see in our garden throughout the year, it is having some impact. 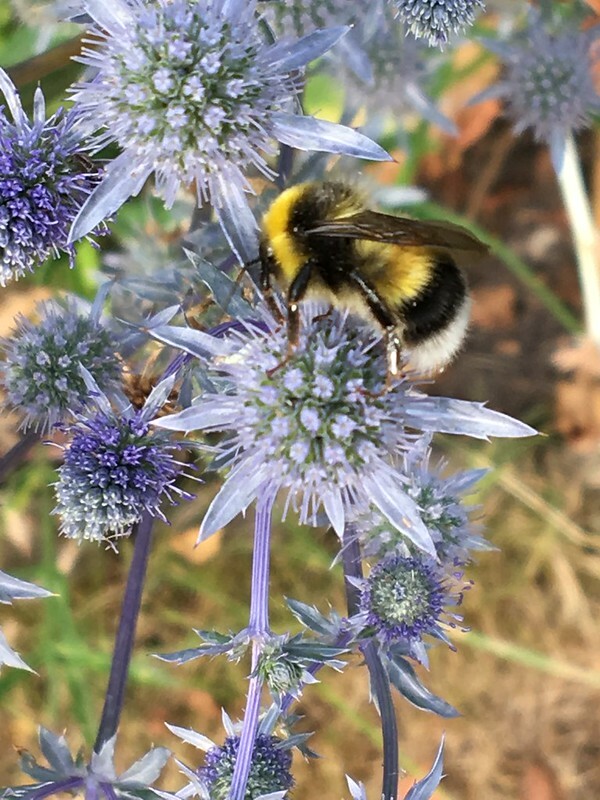 We planted the lovely blue’ish purple Echinops (globe-thistle) some years ago but this year we were also tempted to add a grey/silver variety. Having done so, I began to worry whether it would attract bees as effectively as its more common neighbour. I need not have feared, I am delighted to say that both blue and silver globes have been covered in bees during their peak flowering season. I am also a great fan of Echinacea and have them in pots on the patio and also planted in the border. They can be quite tender but, having lost a couple in pots which were supposedly over-wintering in the greenhouse one year, I decided to risk two out in the border and I’m pleased to say that they have now returned for about four years on the trot so I can’t help thinking that if they survived the Beast from the East, then we’re OK! 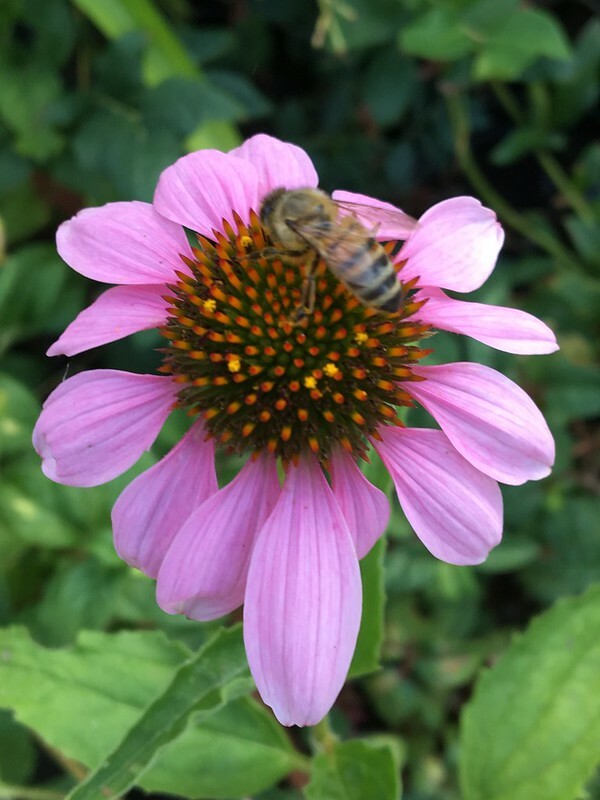 Bees love Echinacea and can often be found clambering around their large central cones. Agapanthus is perhaps the one that surprises me. We planted these many years ago, well before the bee cause caught our attention but the bees do love them. They easily disappear up inside the tubular flowers which gradually open one by one across the whole flower-head. One of the strengths of Agapanthus is this gradual opening. You can never say that the flower is completely open as they will gradually open each bud one by one. Lavender is the obvious bee-friendly plant and we do have three different varieties in the garden – one French and two English types. Although the bees are attracted to them, I wouldn’t say that they are the most popular flower in our garden and this year even the lavender has been drought-ridden, hence the lack of photo! Whilst we’re on the subject of purple plants, I have to mention Eryngium, that very spikey plant. The bees don’t seem to notice its spikiness and happily dive in where others might fear to tread! 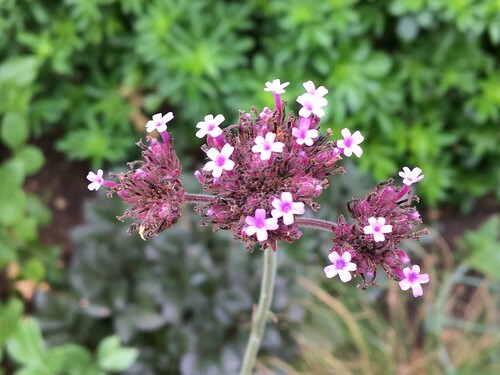 Then of course there is the purple Verbena Bonariensis, with its tall, slender stems topped by clusters of tiny tubular flowers, which is another hit with our buzzing friends. One year we had clouds of Verbena around the garden but then it seemed to vanish. We carefully nurtured a few tiny self-sown seedlings and I’m delighted to say that this year we have had several lovely plants. Unfortunately, when a bee lands on them, they sway around too much for me to be able to capture bee and plant in focus. So apologies for the lack of bee in the photo below! You might be forgiven for thinking that I’m just planting purple plants because I’ve always had a bit of thing about purple! However, the scientists have shown that purple is the colour that bees can see most clearly. For someone who likes purple, it’s a great excuse! Have you taken action to encourage bees outside your back door? Categories: Blog post | Tags: Bees, Echinacea, Echinops, Eryngium | Permalink.